"Development is my name. As long as I develop, I exist." Sorry for the improper picture. But this blog is about me and my life, and I am sorry, but my health is a part of that, too, as well as my art. As a lot of you read in my last blog I was recovering from an allergic anaphylactic chok at the hospital June 14th this year during a test in relation to a long-term examination period dued to some symptomes I have had since April this year. I take it as a good sign, that it takes long time, because it means that I am not a cancer patient. Because in DK we have a priority system at the hospitals. I drank what I thought was fresh water from a jug in my kitchen, which I and my family have drunken fresh water from the last 10 years. So I didn´t notice that one of my family members happened to fill acidiferous cleanser in it. Same colour as water, no parfume, no taste. So I didn´t feel it until 20 sec after I put it inside. THEN THE FIRE BEGAN THROUGH my neck and gullet. 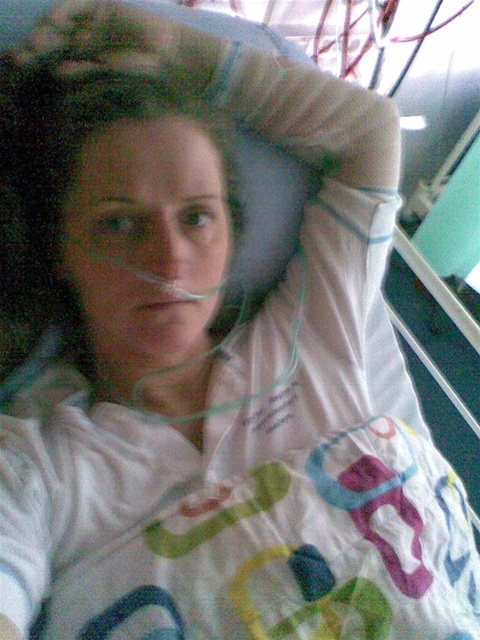 Result: 24 hours acute treatment at the nearest hospital with 5 liter milk and 15 liters of cold water, then tranfer to the expert hospital no 1 i Denmark, Rigshospitalet, where they almost immidiately put me in full anaesthesia and went down with a telescope examining me. Mobile pic is from waking up from that experience, Mon Aug 22nd. "Tressures" found: Swollen red gullet with øsofagusdiverticles and inner mouth to stomach out of order, so I can hardly eat. It is painful, I force myself to eat and I can only eat small servings size thimble from liquid food.... Have to survive on that the next 2-3 weeks for healing up the damages after the acid. Then they have to examine me again and decide what to do about my øsofagusdiverticles..... I also have almost no voise left after the acid and everything tastes like chemicals. In a couple of weeks bioanalysts and other medical experts have go through my gullet with a tube in order to make a short term pressure measurement and the 24 hour pH / impedance measurement of my esophagus, meassuring the movements of my gullet showing how it works or doesn´t work. I also have a psychological trust issue to handle, the familiar relationship with the person who happened to do it. I have to handle that , too, besides my damages and strong pains.This person whom I love very much feels very sorry, almost depressed because of this. Foregiveness is devine, but I am only a human being. It´s really difficult to go home to when you are in physically pains and need care and a hug yourself, but I am working on it. ... I have never been a good cook. Actually, I hate cooking, no natural talent there. One can´t be good at everything, and I am a clown at cooking. Hate it! So I have a development potential there... - and a great opportunity to full fill my own words above from the artbook. I have found a new issue to focus my creativity on trying to cook these special small different 8-10 meals, all day long tryng to have enough to eat. I am creating new alternative "energy bombs" delicious timble recipies helping healing up my esophagus and caring my øsofagusdiverticles. They will take care of them after 3 weeks, maybe with some surgery at long term. Then it´s all over again with my small energy filled timble meals. So I better get used to the small servings and I have started writing down my self-developed recipies. This week´s small meals have had another result: I have lost 12 lbs in 6 days. To much, I know, but I have tryed to regale myself with all the delicacies which were forbidden i 2005-2007 when I lost 80 lbs on my own. I who love food NEVER thought the day would come where I have trouble keeping my fighter weight. At least my weigt loos is in my waist. Now I have the same weight and blood pressure as when I were 17! The word "patient" comes from patience. So as I have to be patient as an in- and outpatient, while hospital treatment at 3 different hospitals are going on all winter long, you curators have to be patient, too. I know iIam at the top of my career as an artist right know, and this situation is frustrating, but I can´t both hold a pen or brush and paint / draw at the same time as I spend all my day surviving on self- cooked timble servings. So, please, you will have to wait until I am ready and until I have faced the consequenses of all this and got used to my new life, too. But don´t worry, I am creating art because I breathe through my art. I create art because I can´t help it. All recognized art medias I have taught myself has come out of a personal crisis. Of course I am also developing new medias right now. Look at me,. I am developing while I am in a hospital bed. I will be back stronger than ever. I am right now practising the art of survival as so many times before. Because I NEVER GIVE UP.